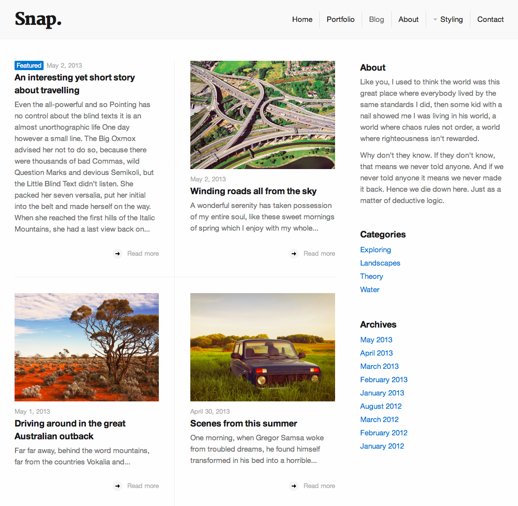 Learn how to set up the Snap WordPress theme. Snap is a beautiful theme that can be used to display posts in different ways via the use of different templates and styles. This tutorial will guide you through how to set up the theme similar to our demo site. This tutorial will explain how to set up the main templates for the site, then address adding customizations with theme options, editor styles, and filters. The “Homepage” template is designed to highlight your best and most recent work. As you can see from the demo site and thumbnail below, this template can have a stunning effect. As the name implies, the “Homepage” template is intended to be the main landing page for your website. We believe that this template gives the best representation of the user’s content. The “Homepage” template is composed of three areas: Featured Area, Content Area, and Posts Area. Each of these areas can be set up to show different types of content, all of which is explained below; however, in order to get started, you must first set up a home page. 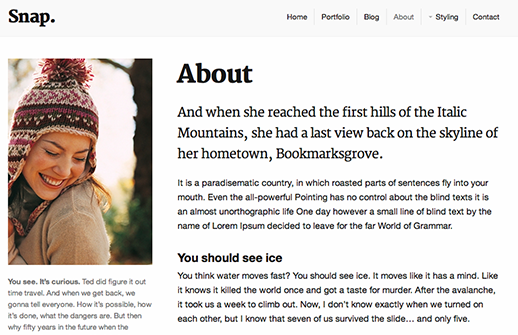 Add a new page titled “Home” from your WordPress dashboard. Choose “Homepage Template” in the Page Attributes box for the value of the Template dropdown. Choose “A static page” from the Front page displays option. Set the Front page to the page created in the first step. Set the Posts page to “Blog”. If posts are designated to be in the Featured Slider, they will be shown in this area. If no posts are designated for the featured slider, and a Featured Image is set for the page, the image will be shown. Finally, if no posts are designated for the Featured Slider and a Featured Image is not set, nothing will be displayed in the Featured Area. The Featured Slider has the first priority in the Featured Area in the “Homepage” template. Whenever there are posts designated for the Featured Slider, a slider will be shown in the Featured Area. It will override any other content in the Featured Area. Go to Posts → All Posts. Click Edit to get to the “Edit Post” screen for the post you want to add to the slider. Find the Portfolio Posts meta box. Check the Show in featured slider box. Make sure you’ve set a featured image that is at least 994px wide for the post. If only one post is designated for the Featured Slider, it will be displayed as a single image since there are no other posts to “slide” to. This image will link to its related post. In addition to showing a slider, a single image can be shown in the Featured Area. A Featured Image can only be shown in the Featured Area if there are no posts designated for the Featured Slider. Click the edit link for the page that is using the “Homepage” template. Click Set Featured Image, which is usually located in the lower right hand area of the screen. Choose an existing image or upload a new image. As long as you currently have no posts designated for the Featured Slider, this image will display at the top of the page. The image used for the Featured Image in the Featured Area must be a minimum of 994px wide so that it fills the entire width of the theme on all devices. The height is flexible in this area and does not need to be a specific value. In the event that there are no posts designated for the Featured Slider and no Featured Image is set for the page, nothing will be shown in the Featured Area. The Content Area allows you to add arbitrary text to the left most column under the site header. Anything that you can put in the post’s content can be placed in this section. We recommend adding informative text that introduces your visitors to your website. Add content to the WordPress Editor. To set a “drop-cap” styling for this area like seen on our demo site, see the Styles section below. We recommend not adding too much content to this area. If this column is too long, it will lead to an imbalance in the page. If posts have been selected for the homepage, the selected posts will be shown in the Posts Area. On the other hand, if no posts are selected for the homepage, the latest blog posts will be shown. Click on the title of the homepage page. Click Screen Options in the upper right hand corner of the screen. Check the box next to Selected Posts. Verify that the Page Template select box in the Page Attributes metabox is set to “Homepage Template”. The Featured Posts metabox shows a list of “Recent Posts” and one of “Recent Pages”. Click an item to add it. The “Recent Posts” and “Recent Pages” lists only show your 10 latest items. To locate more posts, click the Search tab. In the input field, start typing the title of the post or page you want to add. A list of posts matching the search will be displayed. Select the desired post by clicking it or using the down arrow and pressing enter. The post will be added to the “Current Posts” list. If you have 2 or more posts in the list, you can drag and drop them to order the posts. Go to *Pages → All Pages**. Check the box next to Featured Posts. In the *Featured Posts** metabox, posts will be displayed under the “Current Posts” header. Next to each post, click the “Remove” link. Once each post is removed and the “No posts currently associate with this page” notice is shown, save the post. After going through these steps, the blog’s latest posts will be shown. 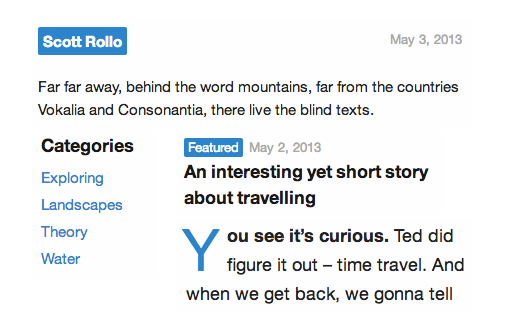 In the Latest Posts section, the homepage will show the same number of posts set to display on the blog page. To change this, see the “snap_homepage_latest_posts_args” filter documentation below. The “Portfolio” template is a beautiful page template that highlights your finest work as represented by a large image, title, excerpt, date and tags. Any page can use the “Portfolio” template and multiple pages can use the template. For instance, a mixed media artist can choose to create two portfolio pages, one featuring her latest photography and the other featuring her latest sketches. Creating a portfolio page with the “Portfolio” template is a two part process; first, you must create a page, then you must add portfolio items. Give the page a title. For instance, our demo site uses “Portfolio” as the title. Choose “Portfolio Template” in the Page Attributes box for the value of the Template dropdown. It is possible to turn an existing page into a portfolio page by changing the page’s template to “Portfolio Template”; however, we recommend being careful as your old content from the page will disappear. 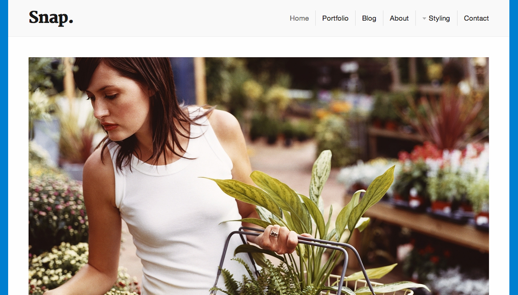 Once the page has been created, portfolio items can be added to the page. Portfolio items can be custom ordered on the page after adding them to the page. Click on the title of the portfolio page that you want to add posts to. Check the box next to Portfolio Posts. Verify that the Page Template select box in the Page Attributes metabox is set to “Portfolio Template”. The Portfolio Posts metabox shows a list of “Recent Posts”. Click a post to add it. (Note that unlike the Homepage, only posts are available for the Portfolio, not pages). The “Recent Posts” list only shows your 10 latest posts. To locate more posts, click the Search tab. In the input field, start typing the title of your posts. A list of posts matching the search will be displayed. Select the desired post by clicking it or using the down arrow and pressing and pressing enter. The term “portfolio item” refers to a post that is displayed on a portfolio page. 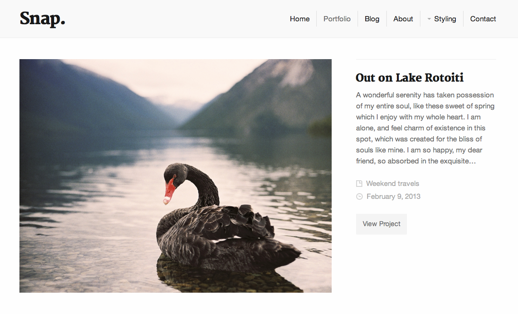 As soon as you add an item to a portfolio page, a regular post becomes a portfolio item. It is important that portfolio items have the correct data set in order to make the portfolio page look awesome. Use a Featured Image that is at least 994px wide. We recommend this width because it will not cause stretching at any screen width. Add an excerpt that is no more than 110 words (please keep in mind you might need to enable Excerpts by clicking on the Screen Options tab near the top). The excerpt is truncated at 110 words in order to maintain the page’s layout. Tags are displayed below the content excerpt and above the date in the portfolio item listing. In order for the tag listing to look best, we recommend capitalizing each word in the tags and limiting the tag list to no more than three items. The “View Project” button label can be changed in the Theme Customizer. While many of the templates in Snap aim to highlight an artist’s work, the “Profile” template highlights the artist and features a portrait image, excerpted text, and content as can be seen on the demo site and the screenshot below. The “Profile” template can be used for any page and can be used multiple times within the same site. This template is excellent for about pages, contact pages, and profiling site contributors. Give the page a title. For instance, our demo site uses “About” as the title. Choose “Profile Template” in the Page Attributes box for the value of the Template dropdown. Add a Featured Image that is at least 292px wide. The image is intended to show a picture of a person and for best results, we recommend using a portrait image. Add an Excerpt. The excerpt is the text that displays below the image on the page. We recommend using an excerpt that is about 100 words to appropriately fill the space. Add post content. We recommend that you add enough content for the right hand column to be longer than the left hand column. Doing so will provide a nicely balanced page. If neither a Featured Image or an Excerpt is added to the page, the left hand column will not be displayed. By default, the blog will be the home page for the site. To set up the blog page, there is nothing that a user must do other than add posts to the site. Featured Images need to use a 4:3 ratio. 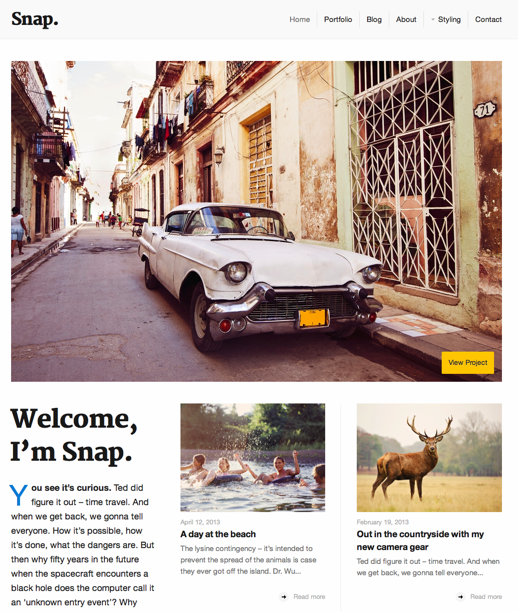 Once installing Snap, the theme will automatically generate a 600×450 thumbnail for newly uploaded Featured Images. Make sure that you use images that are at least 600px wide and 450px high. If you are using existing images, we highly recommend resizing your images using the excellent Regenerate Thumbnails plugin. Please see the guide below. For posts without a Featured Image, we recommend adding a longer excerpt (approximately 110 words) in order for the content to fill the square. For posts with a Featured Image, use a shorter excerpt (approximately 55 words). Regardless of the length of the excerpt, Snap will truncate and add an ellipsis to any content that runs outside of the grid. This truncation ensures the integrity of the grid. The grid layout is Infinite Scroll ready! Install Jetpack and activate Infinite Scroll to implement it. Snap offers the ability to customize certain parts of the theme through the Theme Customizer. Changing options is the easiest way to alter the theme. While you cannot customize every part of the theme with the customizer, the important optional features in Snap have been made available in the Theme Customizer. If you are looking to make changes that are not documented here, please refer to the Snap filters guide and review how to make theme customizations. With your mouse, hover over the site name in the admin bar. In the menu that is revealed, click the Customize link. The customizer will now be shown in the left hand side of the page with the site showing in the right hand side of the page. Snap allows users to set a site logo, with the additional option of setting a hi-resolution version of the logo for use with HiDPI devices. Invoke the Theme Customizer by hovering over the name of your site in the admin bar and clicking Customize. Under the Regular Logo heading, either click the No image button or, if a current image exists, click the image. Drag a logo to the area that says “Drop a file here” or click the select a file link and add a logo. If only a Regular Logo is uploaded, the regular logo will display for all devices. If only a Retina Logo is uploaded, the retina logo will display for all devices, but will display at 50% of its original dimensions. This size reduction is to ensure that the retina effect is achieved. If both Regular Logo and a Retina Logos are uploaded, HiDPI devices will see the retina logo at 50% of its original dimensions and non-HiDPI devices will see the regular logo at its original dimensions. For best results, the retina logo should be exactly twice the size of its intended display size. For instance, if you want to display a logo with dimensions of 100×50, you should use a retina logo with dimensions of 200×100. In the Colors section of the Theme Customizer panel, users can choose to change the color of different elements in the theme. The color controls allow for setting a background color, primary color, and secondary color. Under the Background Color heading, click Select Color. Add a hexidecimal color value or choose a color with the Iris color picker. The new color will be previewed in the right hand side of the page. Under the Primary Color heading, click Select Color. Under the Secondary Color heading, click Select Color. The group of display options allow users to change certain elements in the Snap theme. In the box under the Portfolio Item Button Text, add the desired button text. The new text will be displayed in the right hand side of the page. In some cases, it may be desirable to hide featured images on single post pages. For instance, users may want to show the featured image in the grid blog post listing, but not show the image on the individual post page. Check the box next to Hide featured image on post pages. Check the box next to Hide portfolio posts from the blog. The Merriweather Google web font is used for heading text in Snap. Users wishing to disable the font due to issues with displaying certain characters or to enhance compatibility with web font plugins can do so easily. Check the box next to Disable Merriweather web font. Click the Background Image heading. Under the Background Image heading, either click the No image button or, if a current image exists, click the image. Drag an image to the area that says “Drop a file here” or click the select a file link to add an image. As soon as the image is uploaded, a preview of the site with the background image will be displayed. In the Footer Text text input, enter the desired footer text. Fill in the social URL text inputs. A preview of the links will be displayed in the right hand side of the page. Snap offers a number of custom styles that a user can add to post content. Each of these styles add a little flair to the content, making it that much more visually appealing. The styles are implemented via added buttons in the WordPress editor. Click the button that corresponds with the desired style that was revealed when clicking the Show/Hide Kitchen Sink icon in the first step. The drop cap styling adds a stylized first letter to a paragraph. It is recommended that this styling is only ever used for the first letter in a post or page. 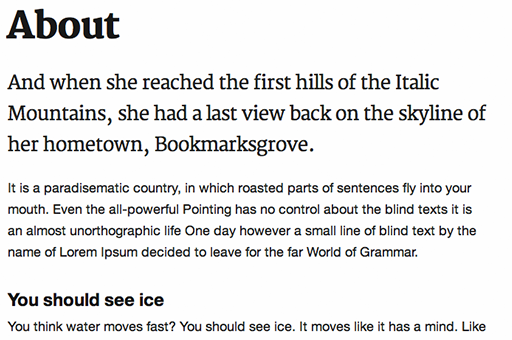 Overuse of this styling in a single page of content can be confusing to the reader. Click the drop-cap button that was revealed when clicking the Show/Hide Kitchen Sink icon in the first step. 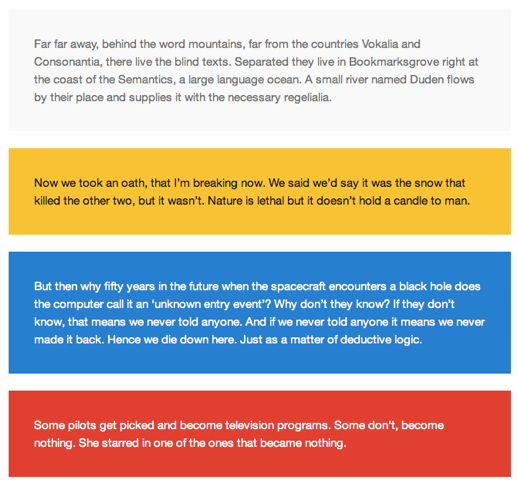 The drop cap color is the same as the “primary” color that can be set in the theme options. While it may be tempting to custom style this element, we recommend only changing the color via the primary color option in order for this element to match other elements in the site. Click the intro button that was revealed when clicking the Show/Hide Kitchen Sink icon in the first step. Snap offers WordPress filters for changing theme behavior with code snippets. Using filters is the most difficult way to alter the theme and should only be done if you are comfortable working with PHP. These filters and the sample code should be placed in your child theme’s functions.php file. While placing these filters in your parent theme’s functions.php will work, the customization will be removed when you update the theme. Read more about setting up your child theme in our customization tutorial. Snap adds formatting buttons to the WordPress editor. These buttons can be disabled by setting the return value of the snap_add_formatting_buttons to false. Menu items that have a child menu are given a class of snap-menu-parent-item. This value can be changed via the snap_add_menu_parent_class_name filter. 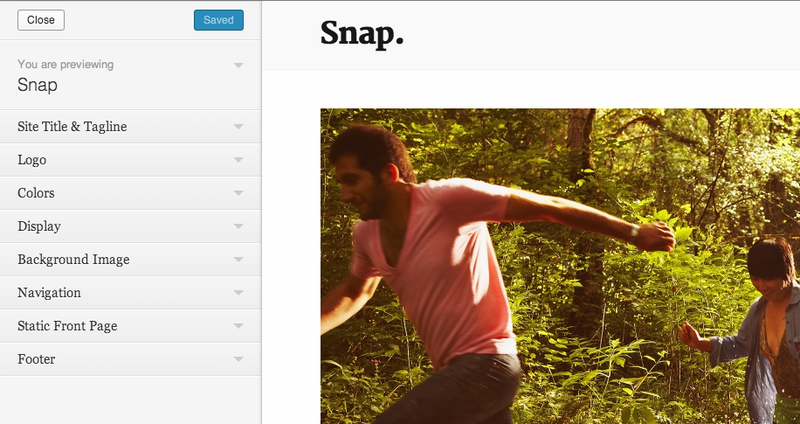 The get snap_get_social_links filter allows you to add, remove, reorder, or edit social icon links in the site footer. For instance, to add a link for instagram, use the code below. The responsive_nav_options filter allows you to easily change the configuration of the responsive nav menu. For instance, a developer can change the “Show Menu” label to “Open Menu”. For more Responsive Nav options, see the Responsive Nav documentation. The responsive_slides_options filter allows a developer to change the options that control the slider on the homepage template. For instance, a developer can change the speed of the animated transition between slides to 2 seconds. The snap_homepage_latest_posts_args allows a developer to change the posts that are displayed in the Latest Posts listing in the Posts Area of the home page. This filter allows for alteration of the arguments that are sent to the WP_Query class when querying for the posts. For instance, a developer can choose to display sticky posts in this section of the home page. The snap_button_text filter allows a developer to change the text displayed in the portfolio project button. While this value can be changed in the customizer, this filter gives the developer greater control over the display. For instance, the developer could choose to use the label “See Photo” on one page, while displaying “View Painting” on another. The snap_attached_posts_label_defaults filter allows a developer to change labels that are displayed in the post chooser for the “Portfolio” and “Homepage” templates. For instance, a developer can change the “Selected Posts” label to “Current Posts”. By default, the post chooser shows the 10 latest posts in the “Recent Posts” area. To alter the posts shown in the “Recent Posts” area, a developer can use the snap_recent_posts_in_chooser_args filter to change the arguments sent to the WP_Query class. For instance, a developer can show only the 3 latest posts. The snap_is_portfolio_post() function determines if a post is a portfolio item (i.e., the post is attached to a page using the “Portfolio” template). A developer can add custom logic to this function. For instance, the developer can always mark post with ID 50 as a portfolio item.